Everyone surely knows by now that bees and other pollinators are essential for pollinating the most interesting and arguably most tasty proportion of our food crops – the usual figure quoted being that around a third of crops we eat depends on bees and other pollinators. But, as someone who loves bees, and started squeezing food crops into my small garden, then being lucky enough to get an allotment (after an 8 year wait), one of the pleasures of growing your own food is the knowledge that I can simultaneously feed the bees too! Here are my favourite crops and tips for feeding yourself and the bees! Yes, that’s right, KALE. Below you can see why. 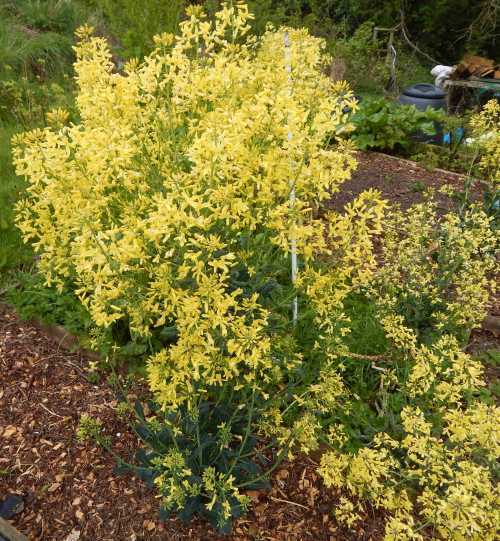 In the spring of 2014, we decided to sow a little Kale (actually, it was a free sample packet, so there were only a few seeds in it) in a small section of an allotment bed. The variety was ‘Nero de Toscana’. By the autumn, we were able to harvest leaves abundantly, however, we also grow a number of other greens, including Swiss chard, spinach beet and spinach, so we knew we had more than enough for our needs. We decided to leave the plants over winter, to continue harvesting in early spring. 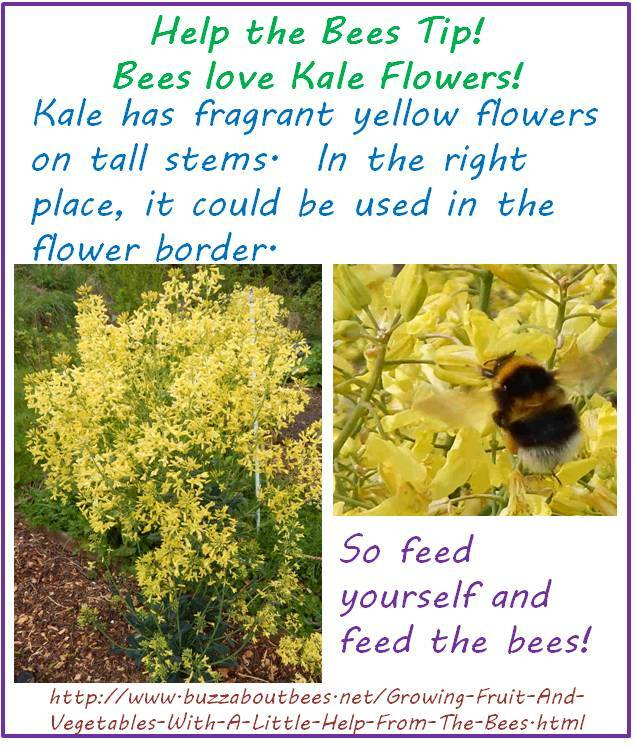 I noticed they had developed flower buds, and decided to leave them for longer - I have never grown kale before, but I had a gut feeling that bees would like the flowers, and they did! 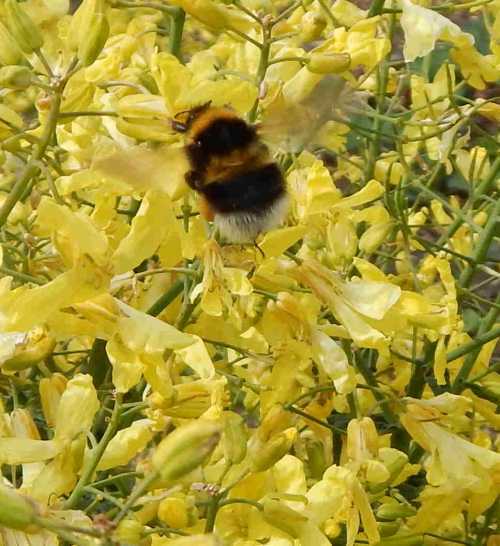 By the time the end of April arrived, we had lots of delicately fragrant yellow blooms, and on a sunny day, the kale has been covered by all kinds of bees, including solitary and bumblebees, as well as other pollinators. I actually think this is such a nice plant, that in the right circumstances, it wouldn’t look out of place at the back of the border. Kale is rich in vitamins, and very easy to grow. The stem is rather thick and sturdy, and it survived the winter to flower the following year. Definitely among my favourite vegetables from a ‘feeds me and the bees’ perspective. I love beans, both broad beans and runner beans. And the bees love the flowers too. Unfortunately, we managed to get chocolate spot on the broadbeans last year, but the runner beans were excellent, helped in no small way by our fuzzy friends, the bees. We always need onions in our house, but being part of the allium family, it's no surprise that some bees like the flower heads. Onions are, however, self-pollinating, but that doesn't stop bumblebees enjoying them. 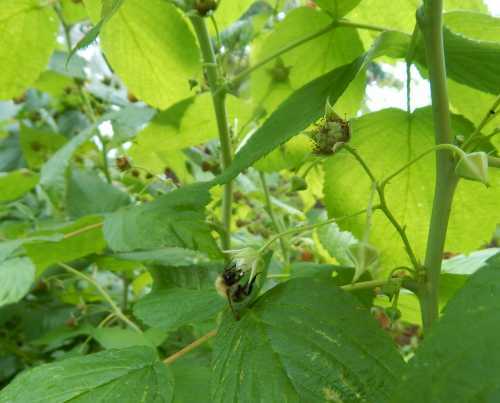 Especially autumn raspberries – at least in terms of crop, but generally, raspberry flowers are again enjoyed by bees - from personal experience, bumblebees especially seem to enjoy them. 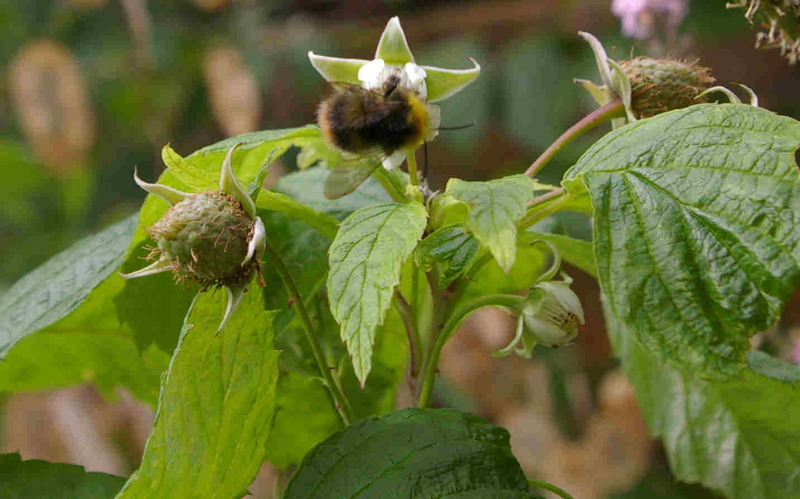 Above - you can just about make out Bombus pratorum feeding on a raspberry flower. We get excellent raspberry crops every year, but find the autumn varieties are especially abundant with fruits. We have a small blueberry bush in our little garden. 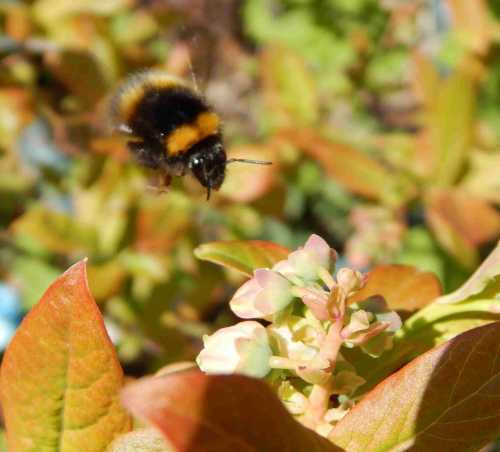 Various species of solitary bees and bumblebees can be seen pollinating the flowers. Blueberry bushes need a certain amount of pruning to help them keep in good condition and ensure flowers, which will of course turn into fruits. Oh yum! We have a small strawberry patch at home, and are establishing one on our allotment. 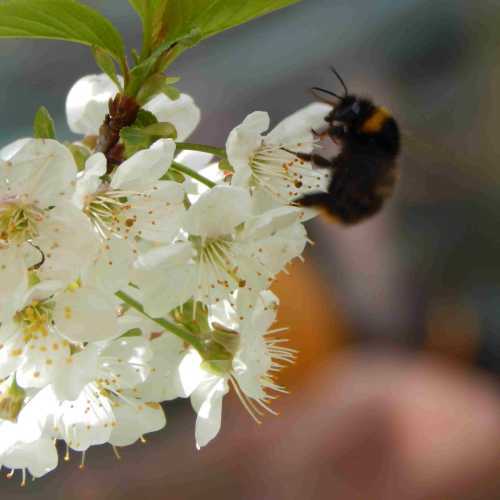 Bees pollinate the pretty white flowers. After say 3 years, the plants are less productive, so you need to keep establishing new plants from the runners. 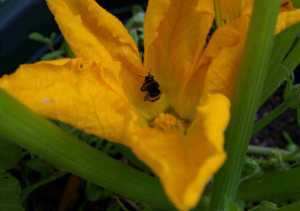 Now, unfortunately, if you are not seeing many bees in your area, you may have to pollinate corgettes yourself. This is achieved by removing the male flower, and pressing it into the centre of the female flower. The male flower has no ‘fruitlet’ at the base of the flower, and the petals need to be picked off to expose the pollen-bearing anthers. 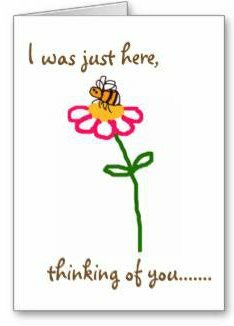 One male flower can be used to pollinate several females, but isn’t it so much better if the bees are doing the work for you? Hopefully, you will indeed have bumblebee visitors to help you out, like this one, pollinating a corgette plant in my garden. I used to grow these in pots, but since I got the allotment, I establish them at home, then take them there. I know some people get fed up of corgettes if they grow quite a few plants and have a heavy crop, especially if they are not keen on making chutneys. However, it is always worth remembering you can wash, chop and freeze corgettes as they are, then cook them from frozen – they are great added to pasta dishes. Apples, Plums And Pears For Pies! 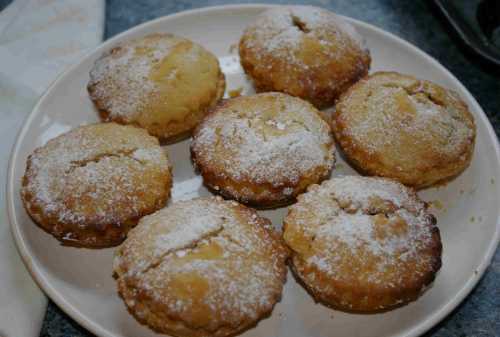 My homemade apple pies - thanks bees! A couple of years ago, we bought a miniature cherry tree. The first year, the tree produced about 3 single cherries, all of which were eaten by wildlife. The second year, we had freak snow, which prevented the tree from being pollinated. In desperation, I went outside with a paint brush to try and pollinate the tree myself (hand pollination is actually a fact of life for some commercial growers where bees are now scarce), but alas I was too late. 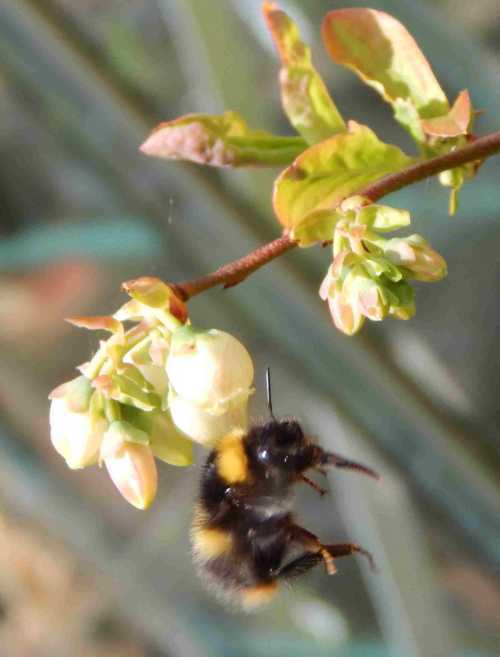 This year, I have seen quite a few bees on the tree, so fingers crossed! 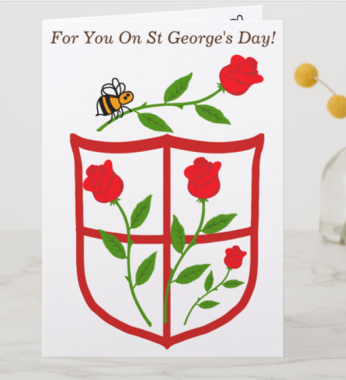 In actual fact, you can grow tomatoes without pollination by bees, but bee pollination ensures a better crop, hence the reason bumblebees are used in commercial pollination of tomatoes. I grow most of mine in the greenhouse, but I grow some species outside where they can be pollinated by bees. I have a page explaining how tomato pollination works here.